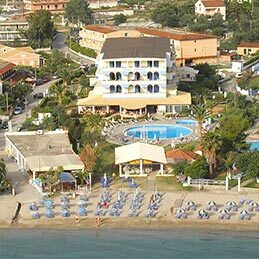 Hotel COOEE Albatros awaits you right on the beach of Moraitica. Built in the traditional corfiot architecture, it combines elegance with comfort. It is a three floor building with a wide terrace amidst a green and tastefully arranged garden. To the seaside of the hotel area one can find the swimming pool, a jacuzzi, a children playground and the Bistrot at the beach. The garden hosts also Daybeds, a Chill-out area and the Beauty and Spa Salon. Relaxing right in front of the hotel the guest can lie at the beach of Moraitica with its fine perble/sand, washed by the Ionian Sea. Suitable for all ages, especially for children because it is very shallow. 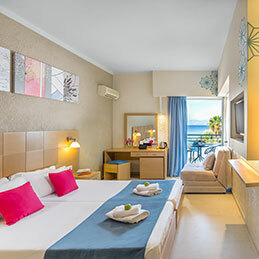 78 spacious and bright rooms placed on the ground and three upper floors expect you, where you can spend an unforgettable holidays in Corfu. To the seaside of the Albatros hotel area one can find the swimming pool, a children pool, a children playground and the Snack Bar. 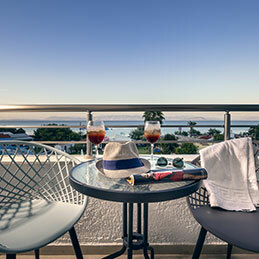 Discover Albatros Hotel and Corfu Island through our photo gallery.